Wapiti are the largest of the deer species present in New Zealand. They arrived in New Zealand in 1905 as a gift from USA President Teddy Roosevelt. They were liberated in the remote south west corner of New Zealand’s South Island. 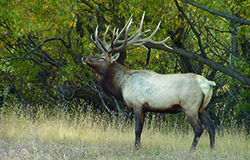 A combination of hunting pressure and interbreeding with red deer has resulted in the demise of the purebred wild elk population to a point where it is almost impossible to obtain a free range trophy that is true to wapiti type. 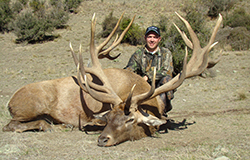 In the 2006 season NZTHL made the record books again with a bull scoring 490 SCI. In 2008 we overtook our current world record with a monster measuring SCI 541 1/8. Our wapiti trophies all score at least in the high 300s. This gives you the opportunity to put a spectacular trophy on your wall. Our hunting method is spot and stalk. Our wapiti begin to bugle in early March and will continue to be vocal through to May. They can be hunted from late February through to the end of August.